Is there such a thing as The Perfect Tripod ? Utopia would be a lightweight , compact yet tall when extended , sturdy ( to withstand winds) , hard wearing tripod that comes with a sensible price tag . I'm still not convinced such an item exists . My 1st proper tripod was a Giottos MTL9351B tripod which I paired with a Ball head & I absolutely loved it ...other than the weight & size . To be fair it collapsed down to fit inside ( just) my medium suitcase ( laid on the diagonal ) but I did have to take the ball head off . It was aluminium so fairly hard wearing but weighed in at 2.18kg's without the head & 2.5kg's with the head . I'm the 1st to admit that I'm not the best at taking care of my gear but I did get in the habit of rinsing it off whenever I'd been to the coast & then I'd give a light misting of WD40 . It had the quick action lever leg locks , one of which decided to fail me whilst on the 1st days of my 1st trip to Iceland .Thankfully I had some sparky's tape tape with me which enabled me to do a temporary fix although it meant the leg had to stay extended for the rest of the trip . I managed to get hold of another one when I got home ( a bargain at £50 from a well known auction site ) & that served me well until the head seized about 2 years later . I then decided I'd quite like a completely new tripod , preferably Carbon Fiber with twist lock legs so I spent a ridiculous amount of time researching on the WWW ., asking friends for advice & reading numerous reviews . The selection of tripods in the market place is mind boggling & the price range is even more so . I don't have a bottomless pit of money so set myself a budget of £200 . The Giottos originally cost me about £150 from WEX and came with a Monopod as there was an offer on so I figured £200 would be about right . I think it took me about 3 months to make my choice & I finally settled on a Vanguard VEO 2 264AB aluminium 4 section tripod with ball head . It seemed to tick all the boxes , light weight but reasonably sturdy , compact , twist grip legs & was within budget. I used for it about 6 months & found it just about perfect for me , it was slightly on the short side when fully extended but that was the only negative I could find. Until one of the leg twist grips decided to seize . In Wales. At a lake .On a sunday . This resulted in me getting rather heavy handed with it & bashing it against a rock which then resulted in one of the rubber feet flying off & landing , yup, you've guessed it, in the lake ! Happy I was not . It then took numerous phone calls to both the store I'd bought it from & Vanguard to try to buy a replacement foot for it . I sent photos of what the foot looked like & of the tripod itself but after receiving the 3rd set of incorrect feet I gave up & resorted to supergluing an oversized foot on to it . 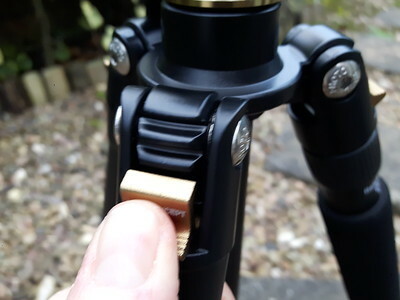 Then I noticed that rubber on the twist locks was starting to come unstuck & a couple of small sealing rings had also parted company from them , neither affected the operation of the legs but I found it both irritating & frustrating .It wasn't the most expensive tripod ever but surely it should last a little longer than 8 months before starting to disintegrate ? I started the research process again determined not to jump in until I'd found exactly what I was looking for & this time I was definitely going for Carbon Fiber . 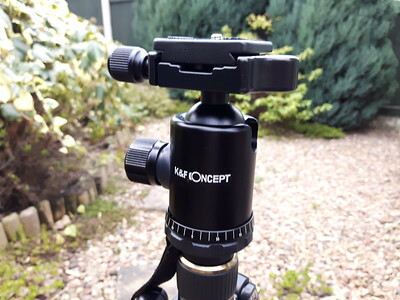 Out of the blue, just before christmas 2018 , K&F Concepts contacted me regarding their aluminium tripods ...would I like to review one ? I politely declined as my mind was set on Carbon Fiber & I really didn't want to try out & review a product that wasn't what I was intending to use . 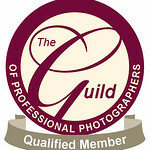 This did prompt me to look at the tripods though as I'd been quite impressed with the products I've tried from them previously - a rucksack & the Variable ND filter . I do feel a little bit sorry for KentFaith ,from what I've seen they produce some really good budget kit but it seems like an uphill battle to break into the UK market where , IMO ,there can be considerable snobbishness about the kit you use . If it's cheap & it works that's fine by me , it doesn't have to be a branded name . Erin at K&F then dropped me a line saying they would send me one of their Carbon Fibre tripods to try & review , click HERE to view on the K&F website. It is the TC2534 Carbon Tripod/Monopod kit . I'd seen a couple of reviews on You Tube all of which sounded positive so i thought why the hell not . It arrived a few days later , neatly packed in it's own carry case complete with shoulder strap , neither of which will ever get used ( but I'm sure some folk will ) & an Allen key ( which I'm sure will get used ) . There's also a nifty little velvet type bag which covers the head - not sure if I'll use it for that but I will certainly find a use for it , can never have to many storage options for niks n naks . It feels lightweight & well made , the twist legs work ( time will tell how long for ) , one of the legs has a dense foam sleeve to make carrying it slightly less cold on the hands & it folds in on itself which makes it ideal for travel as it takes up very little room . So far so good , it ticks all the boxes . I've compared it height wise with the VEO & would say it's approx 5 inches taller with the legs being roughly the same diameter so theoretically it should be just as stable, though admittedly I don't set out to shoot in high winds. 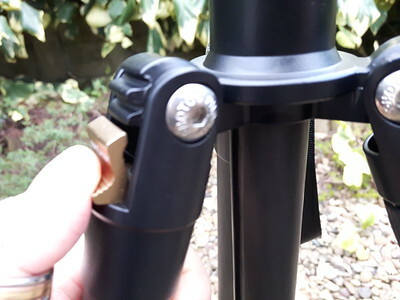 It also has a handy hook at the base of the centre column to hang your bag on for more stability ( The VEO didn't have this ) . The leg angle adjustment system is going to take a little getting used to but as with anything I just need to learn how to get the best out of it . I'm impressed with the ball head as well , it's arcaswiss plate compatible so will work with my L bracket nicely but it also comes with QR plate which will be helpful should I want to mount one of my vlogging cameras on it . 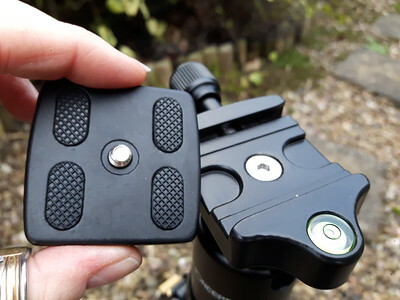 Another nifty feature is one of the legs detaches & can be used as a Mono pod - handy for visits to Studley Deer Park & the like where wildlife & landscape photography combine . There's also a spirit level in the head which will no doubt prove useful though I use my cameras built in level display most of the time . Appearance wise it's quite " pretty " for want of a better word , flashes of gold colored trim break up the grey/black of the carbon fiber nicely & it appears to be well finished . How does it stack up price wise ? 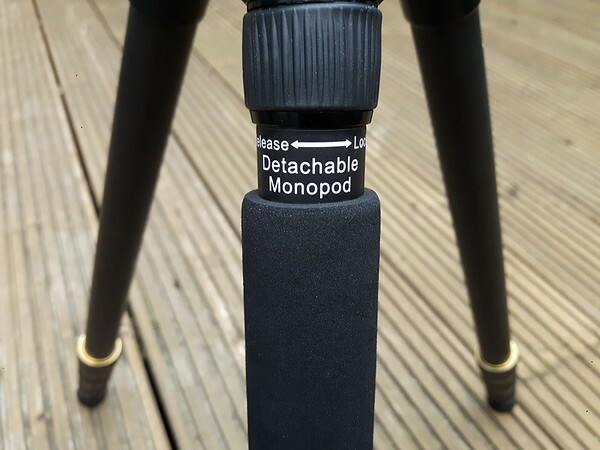 It retails on K&F's website at £118.99 with Free Shipping ( at time of writing Jan 2019 ) which , lets be honest , is a blooming steal for a Carbon Fiber tripod ! This is going to be a long term test , I will be carrying the VEO with me as a back up but the K&F tripod will be the one I'm using each time I go out shooting . Initial impressions are all well & good but the proof is in the pudding , how does it perform in the real world & over a decent period of time ? The intention is to do a short vlog about it on each trip out & to post them here & over on my You Tube channel over the period of a year as a minimum . 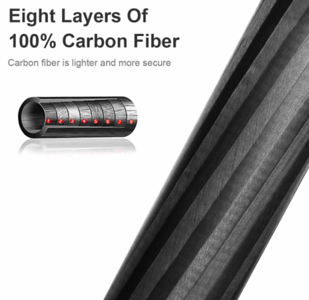 I started the research process again determined not to jump in until I'd found exactly what I was looking for & this time I was definitely going for Carbon Fiber . Out of the blue, just before christmas 2018 , K&F Concepts contacted me regarding their aluminium tripods ...would I like to review one ? I politely declined as my mind was set on Carbon Fiber & I really didn't want to try out & review a product that wasn't what I was intending to use .This did prompt me to look at the tripods though as I'd been quite impressed with the products I've tried from them previously - a rucksack & the Variable ND filter . 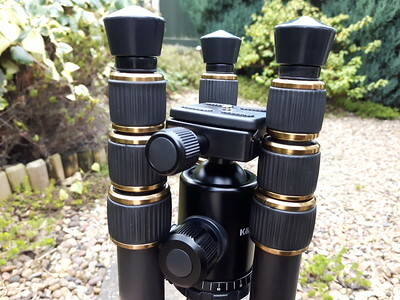 I do feel a little bit sorry for KentFaith ,from what I've seen they produce some really good budget kit but it seems like an uphill battle to break into the UK market where , IMO ,there can be considerable snobbishness about the kit you use . If it's cheap & it works that's fine by me , it doesn't have to be a branded name .Erin at K&F then dropped me a line saying they would send me one of their Carbon Fibre tripods to try & review , click HERE to view on the K&F website. It is the TC2534 Carbon Tripod/Monopod kit . I'd seen a couple of reviews on You Tube all of which sounded positive so i thought why the hell not . It arrived a few days later , neatly packed in it's own carry case complete with shoulder strap , neither of which will ever get used ( but I'm sure some folk will ) & an Allen key ( which I'm sure will get used ) . There's also a nifty little velvet type bag which covers the head - not sure if I'll use it for that but I will certainly find a use for it , can never have to many storage options for niks n naks . It feels lightweight & well made , the twist legs work ( time will tell how long for ) , one of the legs has a dense foam sleeve to make carrying it slightly less cold on the hands & it folds in on itself which makes it ideal for travel as it takes up very little room . So far so good , it ticks all the boxes . I've compared it height wise with the VEO & would say it's approx 5 inches taller with the legs being roughly the same diameter so theoretically it should be just as stable, though admittedly I don't set out to shoot in high winds. It also has a handy hook at the base of the centre column to hang your bag on for more stability ( The VEO didn't have this ) .The leg angle adjustment system is going to take a little getting used to but as with anything I just need to learn how to get the best out of it . 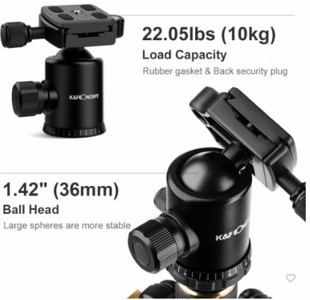 I'm impressed with the ball head as well , it's arca swiss plate compatible so will work with my L bracket nicely but it also comes with QR plate which will be helpful should I want to mount one of my vlogging cameras on it . 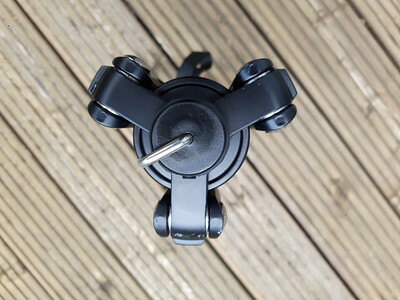 Another nifty feature is one of the legs detaches & can be used as a Mono pod - handy for visits to Studley Deer Park & the like where wildlife & landscape photography combine . There's also a spirit level in the head which will no doubt prove useful though I use my cameras built in level display most of the time .Appearance wise it's quite " pretty " for want of a better word , flashes of gold colored trim break up the grey/black of the carbon fiber nicely & it appears to be well finished . I've now used this tripod on a few trips out which is a far better way to evaluate how good bad or indifferent a product actually is . A couple of short reviews can be seen in the video below, I'll continue to do these over the next 12months , probably every 2-3 months so you can see how it performs with prolonged use in various weather conditions .